Giving season is officially underway. More importantly, we are about to be well-into December. It’s no secret this month represents one of the most critical times of the year for the nonprofit community. We’ve seen the stats reported regularly: Nearly 20% of all annual online donations are made in December and donors tend to give 80% larger gifts during this month. Trends like these make it obvious as to why nonprofits invest time and effort into assembling a solid holiday fundraising campaign. It’s not enough, however, to simply launch a campaign. You need to actively promote it in order to attract attention and donations. With that said, here are 11 ways you can promote your holiday fundraising campaign, starting now. 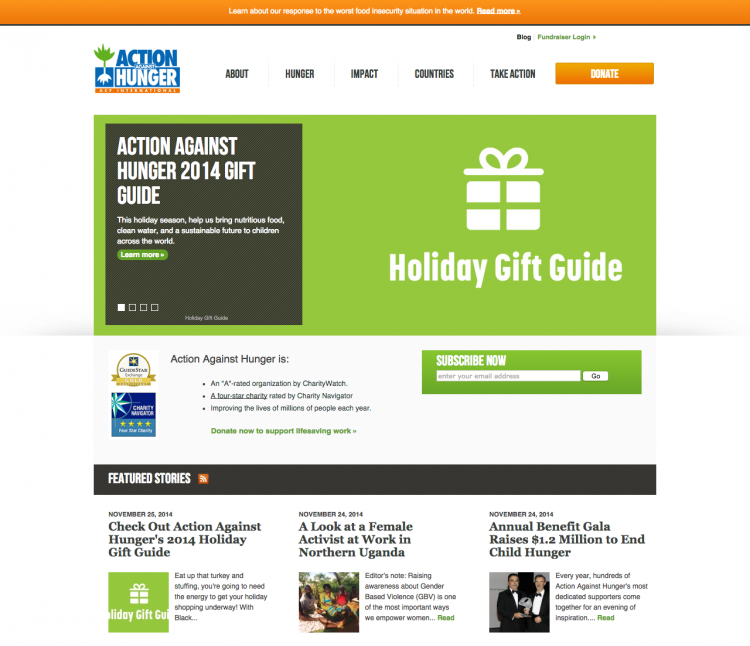 For instance, check out how Action Against Hunger prominently features their gift guide at the top of their homepage. You should similarly broadcast your holiday fundraising campaign front and center on your website. To really nail down the frequency and content of your email campaign, try planning backwards from your holiday fundraising campaign’s end date. This will help clarify an appropriate schedule for your emails. The email: Announce any donation matching campaigns or incentives to encourage people to donate ASAP. Encourage supporters to spread the word about your campaign by including social share buttons in each email. Using tools like clicktotweet.com, you can also build your own custom messages into the buttons that include your campaign hashtag and a link back to your site. Not only does this tactic make it super quick and easy for supporters to share, but it also ensures they send out the exact message you want. It might be tempting to replace all of your standard communications with holiday-campaign promotions, but if you send out a regular biweekly or monthly newsletter, make sure it still goes out in December. Consistency is important, so keep to your newsletter schedule and ensure your holiday campaign is a part of that communication. Remember to still keep your newsletter primarily about your mission (rather than primarily a direct appeal for holiday fundraising). Create a hashtag to help you pull and monitor any messages that mention your holiday fundraising campaign. Make sure to keep up with conversations, promptly respond to any questions or comments, and thank supporters by liking, favoriting, or retweeting their messages. Update your cover and background photos to reflect your branded holiday fundraising campaign. This is an easy way to increase campaign awareness and motivate casual profile visitors to learn more about your initiative. Include links back to your donation page or campaign micro-site in the image descriptions. Twitter and Facebook both allow you to pin one message to the top of your feed, making it the first thing visitors see when they hit your page. On both networks, pin a message about your holiday fundraising campaign, and include a branded image and link back to your website. Create consistency across your communications by reiterating email campaign announcements on your social networks. For example, if you just announced a matching campaign over email, post and tweet about it to increase your reach. Keep in mind these time-sensitive posts should supplement your social media strategy, not comprise all of it. Continue to post engaging, campaign-specific content tailored for each network’s specific audience, and make sure your posts don’t all include a direct ask. It’s well known by now that visuals boost engagement on social media. According to a 2013 Pew Research Study, nearly half (47%) of all adult Internet users repost photos and videos they’ve found online. Help your posts attract eyeballs and clicks by attaching photos, infographics, videos, or other graphics. Brand these to reflect your holiday campaign so viewers get inspired to give back this season. You should have a branded checkout page for all of your campaigns, but it’s an absolute necessity during the holidays. According to a 2012 report by Network for Good, in December alone, organizations with branded donation forms brought in 6 times the donations and raised an average of $5,000 more than organizations with generic donation pages. Create a custom donation form that is branded specifically for your holiday fundraising campaign. Carry over any imagery and copy used in your email appeals onto your donation form as well. This consistency in branding and messaging reassures donors that their gifts are going to the campaign they intend to support, increasing their chances of completing the checkout process. While you’re at it, produce better results this season by whipping up custom checkout pages for donors of different giving capacities. Segment your contacts by past average gift amounts (eg. lower-tier, middle-tier, higher-tier), and during your email campaign, direct each group to different donation forms with appropriate default gift ranges. People tend to give more during the holidays, so you can use this tactic to encourage certain groups of donors to increase their gift amount, without unintentionally downgrading larger donors. Make no mistake about it, your holiday fundraising campaign is one of your most important initiatives of the year. Accordingly, you need to promote it front and center through all of your communication channels. Follow these practices to make sure your organization stays top of mind this holiday season!